A little stress in life is okay. It helps motivate you to get things done and keeps you safe. However, too much stress experienced over time will wear down your body making you sick both physically and mentally. During stressful situations your body releases cortisol (stress hormone) triggering the fight or flight response. During this response your blood pressure rises as your heart beats faster, breathing quickens, muscles tighten and immune system is suppressed, your body stores fat and cells including brain cells begin to break down. Your body is preparing itself to fight the danger or flee. In our society we are always “on”, over scheduled and always connected to our electronic devices and cell phones leaving little time for quiet moments. Each person handles stress differently. Our bodies were not designed to handle long term, chronic stress without consequences. Stress is experienced on every level. On an emotional level stress may make us feel agitated, overwhelmed, moody, tearful or depressed. On a physical level stress can cause us to feel low in energy, headaches, upset stomach, chest pain, rapid heartbeat and may even feel like a heart attack. One may also experience insomnia, frequent colds or infections. Jaw clenching and teeth grinding are additional signs of physical stress. When we are under stress we tend to worry more, become forgetful or have racing thoughts or an inability to focus along with negative thinking which only makes us sink further into a downward spiral to depression. Certainly our behavior is also affected with stress. We may lose our appetite or over eat, procrastinate and even avoid our responsibilities. Some may turn to using alcohol, drugs or cigarettes as a means of self-medicating. Of course nail biting, pacing and fidgeting are also common signs of feeling stress. Long term consequences of stress even affect our mental health causing depression, anxiety, cardiovascular disease, heart disease, high blood pressure, heart attack and strokes. The daily clutter of incessant thoughts in our minds becomes a nagging presence. However, just as we spring clean our homes and de-clutter closets, garages and attics. We also need to de-clutter our minds. Meditation is great way to reduce stress and is the number one reason people practice it. Regular meditation creates benefits on all levels of being, physical, mental, emotional and spiritual. You don’t have to sit and chant for hours. The purpose is to quiet the mind while strengthening the relationship between your mind and body to focus on the present moment. It sounds easy but with our over active thoughts, sitting quietly can be daunting even frustrating at first. Meditation isn’t about doing it “right” but becoming acutely self-aware. It’s learning to listen with your heart. The more aware you are of the sensations in your body, the feelings in your heart and thoughts in your mind, the better you can understand your life and how your thoughts effect your emotions which affect you physically. Becoming a master at monitoring yourself and your thoughts and feelings puts you in the driver seat to your life so you are able to steer it onto the desired path instead of allowing life to happen to you making you feel like a victim. Meditation helps you transform your self-image into greater confidence and self-belief by getting to know who you really are and learning to accept and embrace every part of your true self. Through meditation, you will discover that your doubts, insecurities and fears you thought defined you, are only superficial. Then you can tap into your true unlimited potential that is within you. Increased production of the anti aging hormone DHEA. Studies have found that as little as eight weeks of daily meditation not only helped people feel calmer but produced growth and changes in areas of the brain associated with memory, empathy and sense of self. 1. Reduce your stress – Helps you focus on the present moment not in the past or future. 2. Helps to clear the mind and become aware of your inner dialogue. 4. Improves overall mood through the day. 5. Helps to create distance from situations or events to gain a new, more objective perspective, observing from the outside rather than being immersed and reacting to these situations or emotional triggers. Are you ready to sit in the driver’s seat of your life? Here are some techniques to help you get started with a meditation practice. Before meditating do some simple stretches which helps to start the process of going inward. 1. Light a candle and stare at the flame. Sit quietly and pay attention to the flame, color changes, how it dances with air movement. Whatever thoughts, emotions come up allow them to come and go without judging them or attempting to push them away. Be aware of them then continue to focus on the flame. 2. Sit quietly for 5 minutes each day either before your start your day in the morning or when you are quiet just before bed. Focus on your breathing. Slowly, deep inhale through the nose for a count of 4, hold for 4 seconds then slowly exhale for 4 count, Allow thoughts to come and go. Repeat breathing sequence. 3. Weather permitting, sit outside with eyes closed and pay attention to the sounds, scents and sensations. Birds chirping, wind blowing, leaves rustling. As you sit, scan your body noticing any tightness or sensations. Remain aware of thoughts, emotions and how your body feels. If you are feeling any particular emotion, can you identify it and where you may feel it in your body? 4. Use a mantra, which is a word or phrase to help quiet the mind. Try So Hum (I Am). 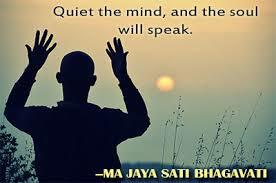 Say in your mind as you inhale “So”, as you exhale say in your mind “Hum”. Repeat for as long as you remain in meditation. Sat, Chit, Ananda (Love, Consciousness, Bliss) is another mantra or you may use any positive phrase that resonates with you. If you find you are becoming frustrated, remember to breathe and let it go, then re focus. Start your meditation 5-10 minutes long and as you become more experienced you will find you are able to sit for longer periods. Remember, meditation is like anything in life. To master it you have practice it and make it part of your daily routine. If you make the time to meditate and quiet your mind you will find life becomes smoother, answers and deeper insights come and your reactions to others and situations are less unconscious. You will become the master of your life guiding it with Love.